Can you provide reproductions of images? What is the German Propaganda Archive? What do you mean by propaganda? Could you include the original German texts? Don’t Neo-Nazis use your material? Are you looking for more material? How may I use the material? Do you speak on the subject? Why are there ads on some pages? Whatâ€™s new on the site? I used to have my e-mail address on every page. The growth of spam led to me getting hundreds of spam messages, both because of software that “harvests” e-mail from web pages as well as viruses that look for e-mail addresses in the web cache of the infected computer. Thus, my e-mail address is available only here. It is a growing collection of English translations of propaganda material from Nazi Germany and the German Democratic Republic. The GPA got started on a whim. I had some translations of material I had done for my students, and thought it might be worth the trouble to put them on the web. Calvin College then decided to encourage faculty to use the Web by providing student assistance. Robert Veenstra, a Calvin College student, joined me in February 1998 in working on the project. He did a general site redesign, and put many images on the site. Calvin student Julie Vugteveen also worked with me to build the GPA during 1999. During summer of 2000, Katie Lynch, a Calvin student, worked with me preparing translations and pages, supported by a grant to Calvin College from the McGregor Foundation. There are two primary kinds of material. First, I include a variety of propaganda material designed to influence the citizenry. Second, I have included “behind the scenes” material designed for propagandists themselves. It was rarely all that secret, but gives an idea of the strategies being followed. I am avoiding material otherwise available. For example, I do not plan to put many of Hitlerâ€™s speeches on the GPA, since English translations of most of them are available in a four-volume edition by Max Domarus. Remember that this is propaganda! Its makers did not hesitate to stretch the truth or lie outright in pursuit of their persuasive goals. Even today, there are people who are so impressed by Leni Riefenstahlâ€™s film Triumph of the Will that they imagine that that is really the way Nazi Germany looked. I usually provide some background information for each item, but if you still have questions don’t hesitate to e-mail me. That is a rather tangled statement, and perhaps a bit overdone, as is Ellulâ€™s tendency, but his point is that modern society is such as to render propaganda almost necessary, a fact he does not like at all. If you find the argument interesting or annoying, I urge you to read his book. My name is Randall Bytwerk. I am a Professor Emeritus of Communication Arts and Sciences at Calvin College in Grand Rapids, Michigan (USA), where I taught from 1985-2014. I am currently Affiliate Professor at LCC International University in KlaipÄ—da, Lithuania. I’ve been interested in Nazi propaganda since 1970, and developed an interest in East German propaganda around 1980. I have published a variety of books and articles on the subject, and recently published a book comparing Nazi and East German propaganda, published by Michigan State University Press in August 2004. Its title is Bending Spines: The Propagandas of Nazi Germany and the German Democratic Republic. The hardcover edition is out of print, but the the paperback is still available. A new edition of my book Julius Streicher was published in September 2001. My book Paper War, a study of Nazi propaganda leaflets dropped on Allied troops during the Battle of Monte Cassino, was published in 2005. 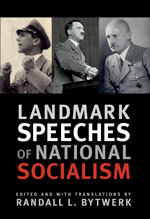 My most recent book, titled Landmark Speeches of National Socialism,was published by Texas A&M University Press in June 2008. It contains material not available on the German Propaganda Archive, and is available in hardcover and paperback editions. My goal is to make available the actual material that persuaded Germans to accept two quite different dictatorships. Nearly all the material in the GPA was previously available only in German, and even then was difficult to find. My hope is that people interested in the subject will benefit from being able to read and see the primary sources. My own students at Calvin College use it in courses I teach. All over the place. Most is from materials I own. Since the Berlin Wall came down in 1989, for example, I have bought a variety of East German propaganda materials. Interesting Nazi items show up from used book dealers. Interlibrary loan is also a wonderful thing. Some is translated from archival material, most often from the German Federal Archives (Bundesarchiv) in Berlin, which holds many records of the Nazi and East German periods.. Sometimes I sell items when I’ve finished with them. If you are interested, visit my page of Nazi-era books for sale. Sorry, no. I am providing the material primarily for those who do not read German. It would take a lot more effort to include the German texts. However, I do provide the source data for each item. If you read German and want the original, a good library should be able to secure many items via interlibrary loan. I have originals of most, but not all, material on the site. Although I’m not in the business of being a library, I may respond to reasonable requests for copies of original sources from scholars. Yes. I’ve been plagiarized by a number of them, in fact. Every now and then I get an unhappy surfer who believes that putting this material on the web must mean I am sympathetic to it. I encourage such people to read my published works on the topic. Not really. I have a big collection of material waiting to get translated. It is there to be used. However, it is copyrighted material. Rather than downloading it for your own site, please use a link unless you have my express permission. Since your site might interest me as well, please drop me an e-mail note (my address is at the top of the page) if you link to anything on the German Propaganda Archive. I have no claim to the images on the site. Teachers and university faculty members may reproduce the material for use in their classes. Students may use it for their work as well. You do not need to ask permission for classroom use. It may not be reprinted for a larger audience without my permission. I maintain a list of good English-language books on Nazi propaganda. Major libraries will have a good selection of these, and even smaller libraries can secure them via interlibrary loan. Some are currently in print. There is not a great deal in English on GDR propaganda. For general information on the GDR, see the home page of the Eastern German Studies Association. The EGSA is now defunct, but the web site will remain useful for a while. Do you speak on this subject? Yes. I speak on many aspects of propaganda, including anti-Semitism, Nazi film, and East German propaganda. Contact me if you are interested. Often. I have originals of much, but not all, of the material on the GPA. If I have an original, I can usually provide higher resolution scans for a price that depends on the purpose and the number of images needed. I also have a large collection of material that is not on the site. If you need a particular image, let me know what you are looking for. I may be able to find it. I taught courses in which I wanted to discuss how Internet advertising works. That gave me the data to use in class. Also, it produces some revenue, which goes into buying more material. Pages with ads (about 5%) are on a separate server, although that will not be evident unless one looks carefully. Pages with ads lack the Calvin College logo on the upper right. Whatâ€™s new on the GPA? I add things regularly. New additions are noted on the GPA Blog. I began that in March 2008. Go to the Joseph Goebbels Page.